From Highway 99: Take East First Avenue and go left onto The Esplanade, the Mansion is on your right(west). The Mansion is located at 525 The Esplanade. 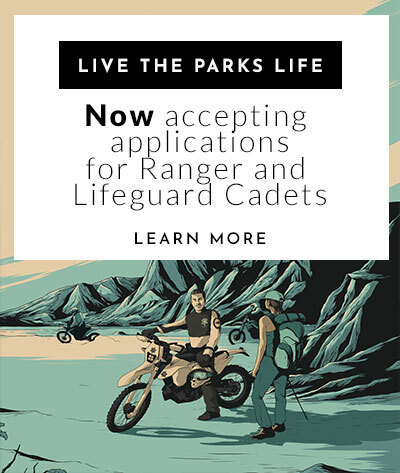 The Visitor Center is open Wed. - Fri. 12-5 and Sat. & Sun. 10-5, tours on the hour. The last tour is at 4:00 pm. Bidwell Mansion State Historic Park is a beautiful, three-story, 26 room Victorian House Museum that stands as a memorial to John and Annie Bidwell. John Bidwell was known throughout California and across the nation as an important pioneer, farmer, soldier, statesman, politician and philanthropist. Annie Ellicott Kennedy Bidwell, the daughter of a socially prominent, high ranking Washington official, was deeply religious, and committed to a number of moral and social causes. Annie was very active in the suffrage and prohibition movements. The Bidwell's were married April 16, 1868 in Washington, D.C. with then President Andrew Johnson and future President Ulysses S. Grant among the guests. 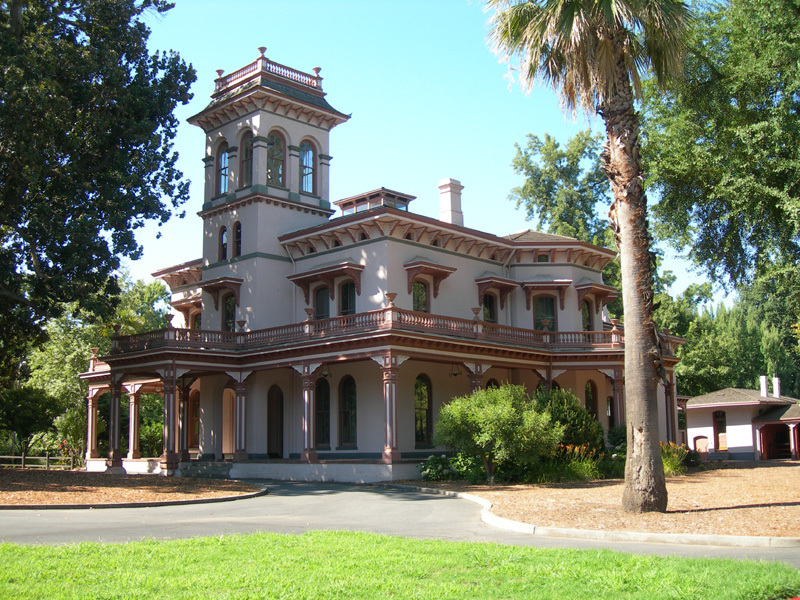 Upon arrival in Chico, the Bidwell's used the Mansion extensively for entertainment of friends. Some of the guests that visited Bidwell Mansion were President Rutherford B. Hayes, General William T. Sherman, Susan B. Anthony, Frances Willard, Governor Stanford, John Muir, and Asa Gray. 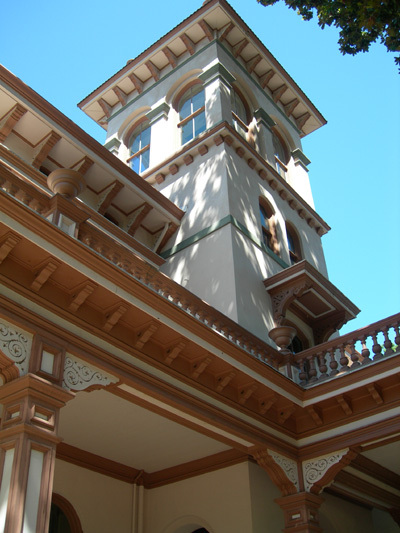 When constructed, Bidwell Mansion featured the most modern plumbing, gas lighting and water systems. The overall style of the three-story brick structure is that of an Italian Villa, an informal, warmly romantic style. The building's exterior is finished with a pink tinted plaster. 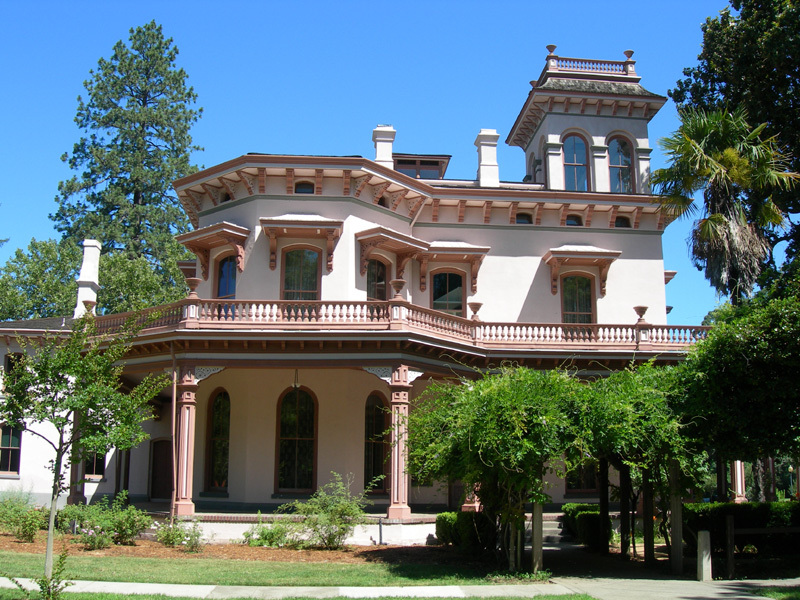 The Mansion is located at 525 Esplanade. Summer and spring are warm; fall and winter can be cool. Layered clothing is advised. The mansion is temperature controlled. Tours consist of three floors of Bidwell Mansion, including approximately 50 stairs. The first floor of Bidwell Mansion is accessible via an exterior ramp. The two upper levels are only accessible by stairs. For visitors unable to climb stairs, an open-captioned video of the 2nd and 3rd floors may be viewed in the Visitor Center. The Visitor Center is completely accessible. It includes restrooms, water fountain, a lobby, a museum store, an exhibit hall and a theater. Tours leave on the hour and take approximately 50 minutes with the last tour leaving at 4 PM. Tours are first come, first served each day. Those interested in a group tour should call ahead for reservations. Large tours (20 or more) may be able to schedule tours for weekdays. Call for scheduling opportunities.